The new thoroughway linking Fort Garry and St. Vital in south Winnipeg has been named in honour of Bishop Vital J. Grandin. With the opening of Bishop Grandin Boulevard citizens of Winnipeg are encountering the name, regrettably unfamiliar to many, of a man who played a significant role in the development of the northwest. Bishop Grandin (1829-1902) spent most of his adult life in the north-western area that would become Saskatchewan and Alberta. He was consecrated Bishop of Satala in 1859 and served as coadjutor to Bishop Tache in the remote northwestern outposts. He became Vicar of Saskatchewan missions in 1867 and Bishop of St. Albert four years later. Bishop Grandin remained in this office until his death in 1902. In addition to fulfilling his ecclesiastical responsibilities the Bishop was an articulate spokesman for Metis rights. He tried unsuccessfully to prevent Louis Riel and other Metis leaders from resorting to violent rebellion in 1884. The Church during his long years of inspired leadership was a major source of strength to a people demoralized by defeat in 1885 and threatened by advancing Canadian civilization. Vital Grandin’s first contact with the west was in August, 1854 when he arrived in St. Boniface as a young priest from France. His biographer, E. Jonquet, reports that under Bishop Tache’s supervision Grandin studied languages and learned about the missions during the first year. He also took catechism in the Metis settlements that later became St. Norbert and St. Vital. Pere Vital Grandin arrived at St. Boniface from France in August, 1854. In 1855 he proceeded to Athabasca accompanied by Bishop Tache, and after the tour of discovery connected with the Lac la Biche Depot had been accomplished by the latter, returned along with him to Ile a la Crosse. In 1857 he was appointed coadjutor, and on 30th November, 1859, was consecrated Bishop of Satala in the temporary cathedral of Saint Martin at Marseilles by Bishop Mazenod. Notwithstanding the extremely low state of his health Dr. Grandin returned to Ile a la Crosse in 1860, and in 1861 proceeded on a tour to Mackenzie River District. Here he founded a depot at a place named by him “Providence,” with a view to its becoming the residence of the new bishop whom it was then proposed to nominate. After penetrating as far as Fort Norman, Bishop Grandin returned to Ile a la Crosse, where he arrived in 1864, after a residence of three years in the extreme north. 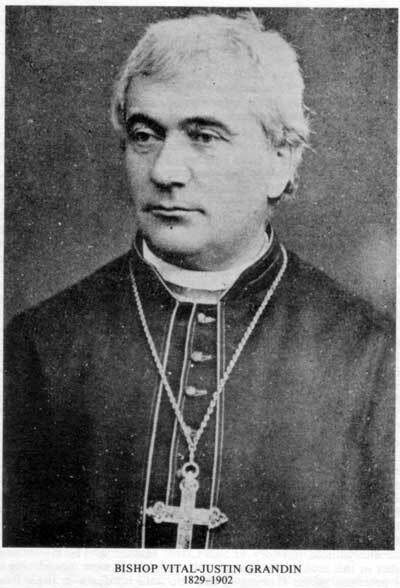 In 1867 he accompanied Bishop Tache to Rome, whence he has since returned and is now actively engaged on the work to which he has devoted his life. Tache’s biographer, P. Benoit, reports that in 1860 when Metis living south of St. Boniface asked Bishop Tache if they could name their community Saint Alexander after his patron saint the Bishop replied that instead the name should be Saint Vital in honour of the patron saint of his coadjutor, Bishop Grandin. St. Vital School, conducted by two sisters of the Grey Nuns, and a chapel opened in that year. In succeeding years Bishop Tache himself said mass there from time to time and instructed the local people. The areas south of St. Boniface and Winnipeg separated by the Red River became known as East St. Vital and West St. Vital. The western section became Fort Garry following the creation of the rural municipality of Fort Garry in 1912. The St. Vital Parish Church west of the Red on Pembina Highway perpetuates the former name. The Grandin School District which was set up in this area was later consolidated with the School District of Fort Garry. The municipality of St. Vital on the east bank of the river amalgamated with the city of Winnipeg in 1972. Today, Bishop Grandin Boulevard links both parts of old St. Vital. Bishop Grandin’s name will be remembered. 1. Rue Grandin in north St. Boniface was also named in his honour.